A long time ago I started this Y Seams blog in order to have a place where I documented the fun stuff I made, so I’d have a place to go look at my projects concisely. Well, I took a break from sewing/quilting in 2013 for the most part, and so many projects got put on hold. There are so many fun little projects I would love to do but I don’t want to have the same unfinished projects 30 years from now that I have today; therefore, when I get little bursts of creative energy (and the time to utilize it) I am focusing on those. 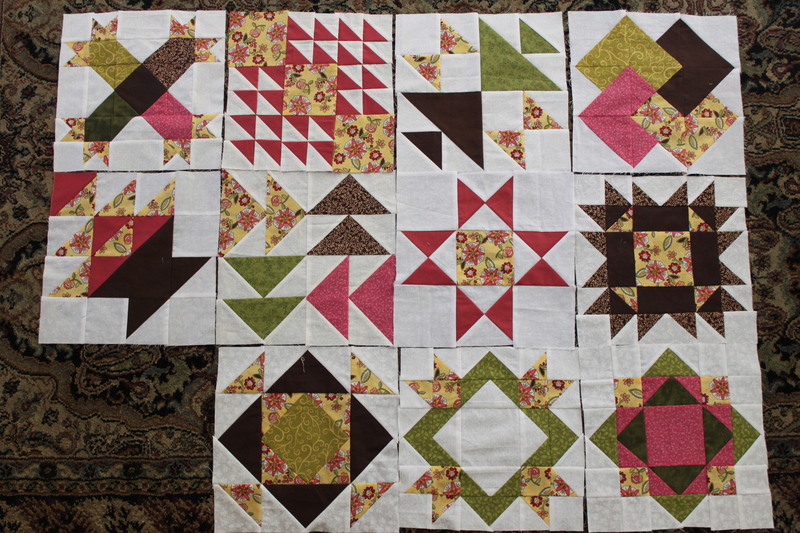 If you’ve scanned through all my past posts then you’ll remember my random little quilt blocks featuring brown, green, pink, and yellow fabrics. This past week I made four more, and fixed one that I had made 2 years ago to better coordinate with those in this collection. This is not the final layout.